Those that know me well know that I'm a bit of a germ freak. I've always been overly cautious (re: weird) about getting sick, to the point that some closest to me may or may not have accused me of being a germaphobe. So you can imagine my dread for this time of year, when everyone and their mother seems to be coming down with a little something or other, no matter what preventative measures have been taken. 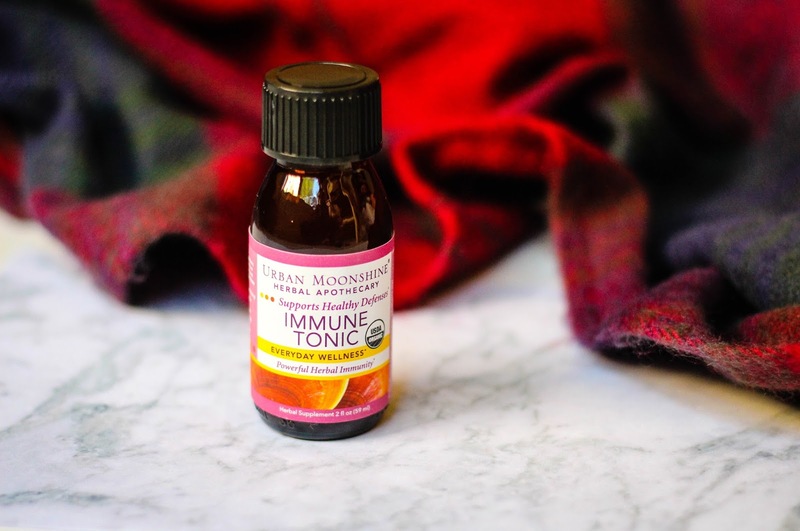 It's for this reason that I decided to give myself a little extra assurance, using the herbal supplements of the Urban Moonshine Immune Tonic*. I reviewed a few pieces of this line awhile back and was really impressed with how well the brand's supplements actually work. Each tonic is geared towards a specific cause, containing an array of herbal supplements to help remedy the issue. This particular formula uses licorice root, ginger, Reishi mushroom and Maitake mushroom to build health over time, boosting your immune system. While the concoction isn't meant to cure or heal ailments, by any means, it does everything right to help keep your system prepared to fight anything off, which is really all I could ask for. You can take 1/2 a teaspoon of this anywhere from two to five times a day, though I usually max myself out around three times (morning, noon and night, if possible), mixing the liquid in with a bit of water. Overall I've been quite impressed with this little tonic, which has probably been my favorite of the three I've tried. I've become quite a fan of herbal supplements in this past year, and have felt some great benefits from taking them often. If you're in the market for a little immunity booster yourself, I'd definitely be the first to recommend this guy, which is available in a variety of different sizes for you to try.